When San Diego International Airport (SAN) decided to build its first parking garage, officials did not want a dingy gray concrete box. Instead, they asked designers to build a parking plaza. It has been about seven years since Uber and other transportation network companies (TNCs) first hit the streets in the United States. And just as airports begin to secure and analyze meaningful data about their effect on parking and other non-aeronautical revenue streams, another major force is preparing to merge into the market. In less than 18 months, the first autonomous vehicles are scheduled to be in commercial operation. As North Carolina continues to grow as a popular tourist destination, Asheville Regional Airport (AVL), in the western part of the state, is working to keep pace with the associated influx of passengers. 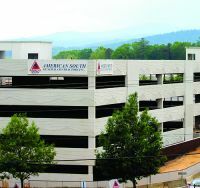 The Greater Asheville Regional Airport Authority recently addressed record demand for parking by constructing a five-level structure that will not only increase capacity but also represent some of the region's landscape on its exterior facade. It wouldn't be wise to manage a grocery store by stocking an impressive array of fresh produce while skimping on the quality and variety of meats or baked goods. All departments must be strong. 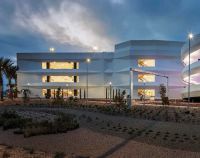 A new $46 million rental car facility at El Paso International Airport (ELP) reflects a simple but sometimes-overlooked truth: Airports and rental car agencies both benefit when travelers can rent cars quickly and efficiently in comfortable, carefully conceived structures. In 2009, parking operations at Fort Lauderdale-Hollywood International Airport (FLL) were basically on life support. With volume and revenue sliding at alarming rates, the executive team drafted Doug Wolfe, FLL's chief financial officer, to revive the ailing profit center. "Our customers were abandoning us and we were losing parking revenue," recalls Wolfe. "The off-airport parking businesses grew from 2% to 12% of market share. Something had to be done." The new 2.1 million-square-foot rental car center at San Diego International (SAN) consolidates the busy airport's car rental operations under one roof to maximize operational efficiency and enhance service for customers. Given the airport's active car rental market (more than 1 million transactions per year) and limited overall footprint (661 acres for all airport operations), the project was a tall order to fill. 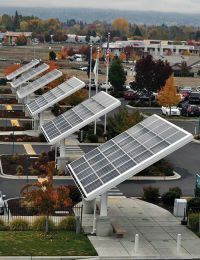 Two U.S. airports - one a major hub in the North, the other a small origin-and-destination facility on the West Coast - use barely any electricity to operate some of their parking facilities, thanks to solar panels and light-emitting diode (LED) lighting. Minneapolis-St. Paul International Airport (MSP) just turned on a $25.4 million solar array built on top of two parking garages at its Lindbergh Terminal. The 8,700 solar panels are expected to produce 3 megawatts of electricity per day. "Going Green" is more than a slogan at Burlington International (BTV); it's a literal description of the Vermont airport's recent environmental project. 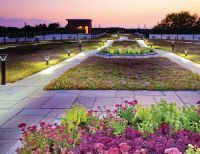 The 500-kilowatt solar array BTV installed on top of its parking garage last year includes a verdant rooftop garden - a fitting feature for the busiest airport in the "Green Mountain State." When searching for a competitive edge, many airports automatically focus on developing new air service. Baltimore/Washington International Thurgood Marshall Airport (BWI) is also developing its parking shuttle service. Executive Director/Chief Executive Officer Paul Wiedefeld and other airport officials realized that with more than 25% of their passengers riding buses to and from airport parking lots, the shuttle system could make or break BWI's reputation as an "easy come, easy go" airport. Recent changes to operational practices are already showing measurable improvements, and investments in new technology to enhance customer service are also under way. As Dallas/Fort Worth International Airport (DFW) moves further through its $2.69 billion Terminal Renewal and Improvement Program, customers parking at Terminal A will benefit from a completely rebuilt structure equipped with new technology. Tweed-New Haven Airport (HVN) recently fixed a host of landside traffic problems by designing and rebuilding its roadways, parking lots and taxi pick-up area. The nearly $1.5 million project untangled what Executive Director Tim Larson describes as a "pretzel-like, almost figure eight, configuration" that had plagued the Connecticut facility for years. Airport managers wanting to maximize revenue while offering passengers an upgraded landside service option may want to take a page from the playbook at Tulsa International Airport (TUL). Minneapolis-St. Paul International Airport (MSP) had a decision to make when the Metropolitan Airports Commission signed a new agreement with the Minnesota Pollution Control Agency in spring 2013. MSP essentially had two options: Overhaul the drainage system in its parking structures or change the way crews manage and discharge water runoff when cleaning them. There's a new parking competitor nipping at the heels of airports throughout the United States, but there are no new lots or facilities in sight. The company, Greenbee Parking, books travelers into parking lots at hotels and existing facilities run by off-airport operators via its website, Greenbeeparking.com - at rates ranging anywhere from 30% to 75% less than airport prices. Passengers pay in advance, bring a printed copy of their online confirmation to the participating lot and ride the hotel or off-site operator's shuttle to and from the airport. Airports have a new tool in their arsenal to keep off-airport parking providers at bay: search engine optimization (SEO), a method of improving an airport's website performance by improving the order in which it pops up during "natural" or unpaid Internet searches. Generally speaking, appearing as early and as often as possible increases an airport's chances of potential customers clicking on its website instead of a competitor's. 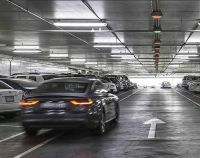 Following in the successful footsteps of U.K. airports that fundamentally changed the way patrons park, Vancouver International Airport (YVR) has introduced pre-booking options that have already doubled its online parking reservations. In August, Dallas/Fort Worth International Airport (DFW) flipped the switch, so to speak, on a new high-tech parking system. The $50 million project includes a new parking and revenue control system, two new entry/exit plazas, command centers at each plaza and extensive information technology infrastructure work. Chicago's Midway International Airport (MDW) created a new traffic pattern for travelers who rent vehicles with construction of a $55 million consolidated rental car center. It's hard to launch a construction project of any size at land-locked Boston Logan International Airport (BOS). Surrounded by water to the north, east and south, and bordered by a city neighborhood to the west, planners have very little wiggle room to divert traffic and virtually no ability to suspend operations. Parking is a perplexing challenge for many airports. Harried travelers running late get irritated driving up and down rows looking for available spaces. Exhausted travelers who can't remember where they parked wander lots looking for their vehicles. When parking fees account for 40% or more of an airport's total operating revenue, losing market share to independent off-site vendors is no small issue. There are, however, several strategic moves airport operators can make to stay competitive. A parking garage may not be the most fascinating airport project, but it certainly affects passengers' overall experience - especially in Ohio, where the weather is often unpredictable. Dayton International Airport (DAY) is consequently leveraging its $25.7 million parking structure as a competitive edge against three other airports within a 90-minute drive.